LAT: 7:21, no errors. WSJ: 8:45, no errors. Newsday: 6:54, no errors. Jones: 11:31, no errors. The Fiesta is a car introduced by Ford in 1976, and is a “model that has legs”. There have been seven generations of Fiesta made, with over 16 million cars sold. (of a concept, phenomenon, something discussed, etc.) To have the ability to endure, stay relevant, or continue to maintain interest. That theory really has legs—years later, most people still think that……..
LAT: 7:53, no errors. Newsday: 4:34, no errors. WSJ: 7:02, no errors. Jones: 15:36, no errors; with references to contemporary culture (TV, music) that I simply had to guess at and am quite surprised to have gotten right. Croce at 4. Croce’s latest: 1:29:59, no errors. One of those with so many unfamiliar entries you feel as if you’re constructing a crossword puzzle, rather than solving one. But, in the end, all doable, with few doubts … 😜. 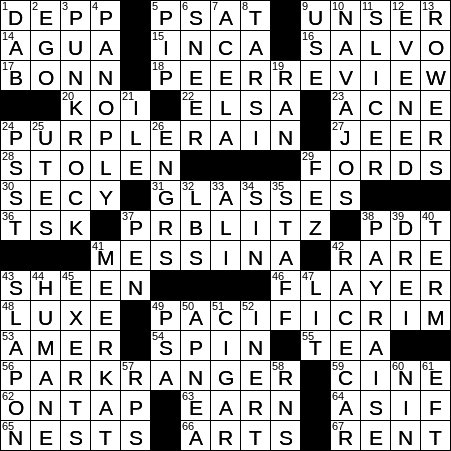 17 across. There is another Beethoven movie I enjoyed. Eroica (2003) starring Ian Hart as the composer. About the writing of Symphony No. 3. Music performed by Orchestre Révolutionnaire et Romantique; Conducted by John Eliot Gardiner. No longer available on Netflix, but Amazon has the DVD. @Allen Dickerson yesterday – women (old?) like myself love ETSY, and wondered how long it would take for it to appear in a puzzle. I mentioned it during that long period as a good word for crosswords. I don’t mind telling you that I suspect prejudice against women’s interest. You guys sure get enough sports in puzzles, which I could do without. I liked today’s puzzle. Smooth and clever. I’ve seen Etsy a lot in cws. didn’t know. Very tough puzzle, I thought, but you guys did great as usual. Thought that “panoply” and “flayer” were words for later in the week. Actually, I’ve never heard flayer used that way at all. Otherwise it wasn’t much of a struggle for me. 9:37. Fun one. Theme helped a little. I didn’t know there was a city in Nevada in the Mountain time zone. I use a cross pen and have for years. It’s the only “fancy” pen that I can actually write with. I can’t write with fountain pens….probably a left-handed thing. If everyone had veto power over the content of puzzles……they’d be blank. 8 minutes even and no errors. Fun, with a few little bumps in the road to keep one honest. No errors– too many initials in this one, IMO– tho I do agree with Jeff that if we all had veto power the grids would be blank. Sfingi, I also like Etsy, and I remember wondering when it would show up in crosswords! It seems it’s been making regular appearances for 2 years now. I tried selling my vintage clothes there a few years ago– didn’t have any luck, but I do shop on the site.